It is amazing to think how Fender can have expensive high-end guitars on one hand, and have its reputable name printed on low-cost guitars on the other. And even more amazing is how they maintain quality and consistency while setting the price down rock-bottom. This is exactly the case of the Fender CP-100. 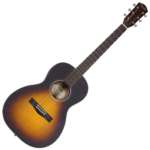 This affordable parlor mini acoustic guitar is mainly designed for travel and casual playing, whether you are at home, on the road, or by the campfire. 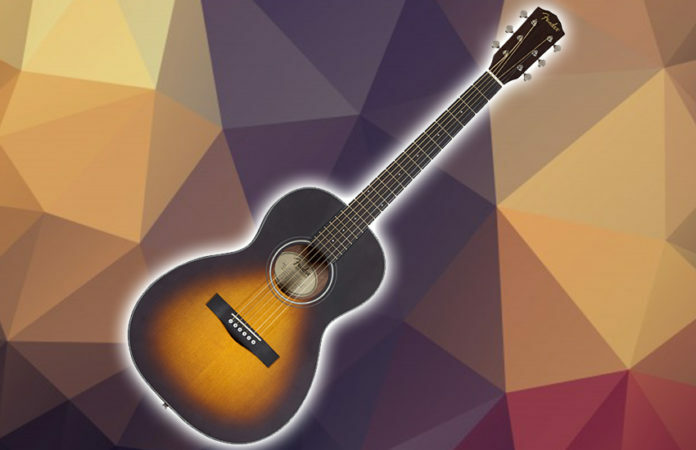 It has pretty much the same standard tonewood and hardware as you often see in other low-end, entry-level acoustic guitars on the market today. But what sets the Fender CP-100 apart in its price range is the quality of sound it produces. The Fender CP-100 is made of a laminated spruce top and laminated mahogany back and sides, coated in a satin finish. The body is so well put together thanks in large part to its quartersawn scalloped X-bracing system. The neck is made from mahogany, and it has a slender profile that houses a rosewood fretboard sitting on top of an artificial compensated bone saddle, a bunch of highly visible dot inlays, an artificial bone nut, and a dual action truss rod. On the headstock are a standard set of six open-gear tuners. The strings are Fender’s own Dura-Tone 80/20 steel strings. As mentioned in the introduction, the Fender CP-100 has a surprisingly good sound for a guitar whose body is made entirely of laminated tonewood. 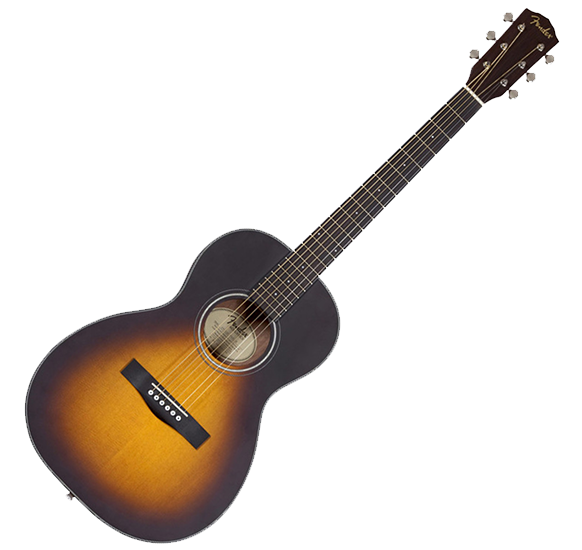 The laminated spruce top, in particular, facilitates the impressive projection of the guitar. The laminated mahogany back and sides allow for a booming sound rich with all sonic frequencies and heavy resonance. All these while sustaining brightness and a slightly more mellow atmosphere. The sound output leans towards the mid-range tones. The volume is reasonably good. However, this might be debatable as some would prefer the projection of a solid top as they are fuller. It comes down to personal preference at the end of the day. But overall, the git box’s tonal spectrum and quality is something that beginner’s and advanced players alike would revel in. Not to mention that this guitar is lightweight and easy to play. The body is compact to carry around, while the neck feels smoother than what you would expect. After all, it is made for travel and beginners. The Verdict: Should You Buy Fender CP-100? The Fender CP-100 is a masterful piece of work. Considering the affordable price tag that comes with its brand name, this guitar is a worthy investment that you will never regret as a beginner. Sure, it does not have the best sound and build quality among other cheap acoustic guitars on the market. But taking the value for money factor at the center of your decision-making, the Fender CP-100 can bust all ugly expectations. If you want a compact 3/4-size parlor acoustic guitar that will not break the bank, the Fender CP-100 is a great candidate to consider.